Quidam: a nameless passerby, a solitary figure lingering on a street corner, a person rushing past and swallowed by the crowd. It could be anyone -- a member of the crowd, one of the silent majority. It is the one who cries out, sings and dreams within us all. 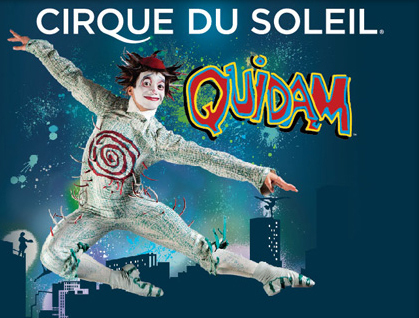 Cirque du Soleil has announced that its newest arena show, "Quidam," will be presented in Boston at Agganis Arena for eight performances only, from September 7 - 11. The international cast features 52 world-class acrobats, musicians, singers and characters. In this ethereal evening, Young Zoé is bored. Her parents, distant and apathetic, ignore her. Her life has lost all meaning. Seeking to fill the void of her existence, she slides into an imaginary world -- the world of "Quidam" -- where she meets characters who encourage her to free her soul. This is a place that beckons; a place for dreaming where all quidams, by proclaiming their individuality, can finally emerge from anonymity. From a group of 20 street performers at its beginnings in 1984, Cirque du Soleil is now a major Québec-based organization with 5,000 employees, including more than 1,300 artists from close to 50 countries.